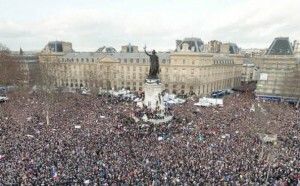 The massive demonstration in Paris on Sunday was an impressive day that will long be remembered. With an estimated 1.5 million people walking in central Paris to demonstrate against terrorism, this was the largest demonstration France has seen since the end of World War II. If you add the totals of similar demonstrations in other cities in France and around Europe, more than 3 million people demonstrated against terrorism yesterday. Seventeen people were killed in three attacks around Paris last week. “Only” four of them were Jews. The point could be made that other than the Jews, these were targeted murders. But in the case of the Jewish victims, who were in a kosher supermarket buying food for Shabbat, they were killed because they were Jews. Again. As a result of the attacks, this was the first Shabbat since the Nazi occupation that authorities determined it was too dangerous to have Friday night services at the Grand Synagogue. The synagogue was open on Shabbat morning, however. The four Jewish victims will be recognized by Israel as victims of terror. Their remains will be flown to Israel where they will be buried in Jerusalem. Yohan Cohen,הי”ד, was an employee of the Hyper Cacher supermarket. He was 22. Yoav Hattab,הי”ד, a student from Tunisia was the son of the chief rabbi of Tunis. He was 21. Phillipe Barham,הי”ד, was an executive at an IT company. His father and brother are rabbis. He was 45. François-Michel Sa’ada,הי”ד, was a retired father of two. He was 64. The demonstration was also a day of grand gestures and platitudes. World leaders walking in arm-in-arm in central Paris included Germany’s Chancellor Angela Merkel, the UK’s Prime Minister David Cameron, Jordan’s King Abdullah, the Palestinian Authority’s President Mahmoud Abbas, US Attorney General Eric Holder, and Israel’s Prime Minister Binyamin Netanyahu. The Israeli delegation also included Foreign Minister Avigdor Leiberman and MKs Eli Yishai and Naftali Bennett, as well as Natan Sharansky, chairman of the Executive of the Jewish Agency for Israel. Over and over viewers around the world heard the words solidarity, unity, and defiance. This was in addition to the concepts on which France was founded: liberty, equality, and fraternity. The point was made that French Jews are French first. But that doesn’t mean they don’t have a reason to be afraid. The murders at the Hyper Cacher were not an isolated incident. According to one source, there were about 1,000 hate crimes in France in 2014. Half of them were against Jews. This despite the fact that only 1 percent of the French population is Jewish. In fact there are about 500,000 Jews and 5-6 million Muslims in France today. Statistics collected by SPCJ, a French-Jewish security organization, indicate that the number of anti-Semitic incidents rose by 91 percent in the first seven months of 2014 compared with the same period in 2013. At the same time, there are an estimated 1,000 French jihadis fighting with ISIS in Syria and elsewhere in the Middle East. What happens when they come “home” to France? It is no wonder the Jews of France feel besieged. He continues: “I think that in the next year, 15,000 Jews will arrive in Israel. Even those who have no plans to make aliyah to Israel are making sure their passports are valid,” he blogged. Danny Gillerman, a former Israel ambassador to the UN, who was interviewed on one of the international television networks said that it’s time to stop being politically correct. Netanyahu told the Jews of France that, “Jews have the right to live wherever they want. But Jews these days have an opportunity that did not exist in the past. To live freely in the only Jewish state, the State of Israel. “Any Jew who chooses to come to Israel will be greeted with open arms and an open heart. It is not a foreign nation,” he said. Dan Béchar, who made aliyah with his family five months ago, said that “Jewish people love France. We wanted to stay. It’s as if you love someone but she doesn’t love you back. I think it’s over for the Jews in France,” he said.